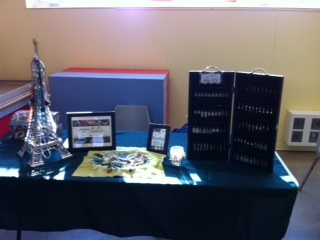 On November 2nd I will be joining my friend Meghan at my very first craft show at All Saints High School in Kanata. 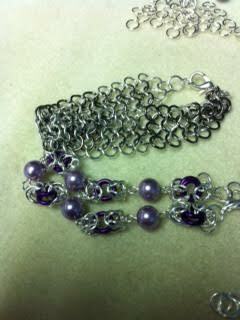 So I have been busy getting lots of fun things ready to bring. 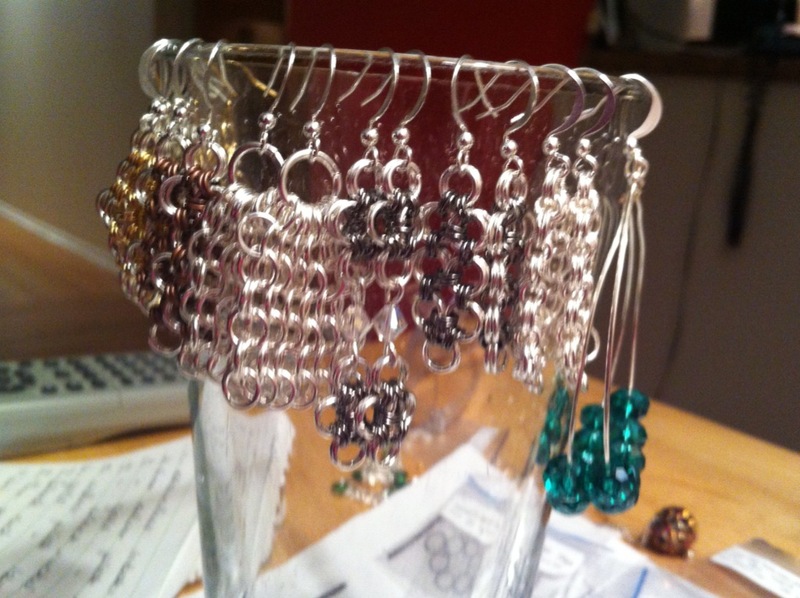 The only other sales I have done have been in my own house with varying success. 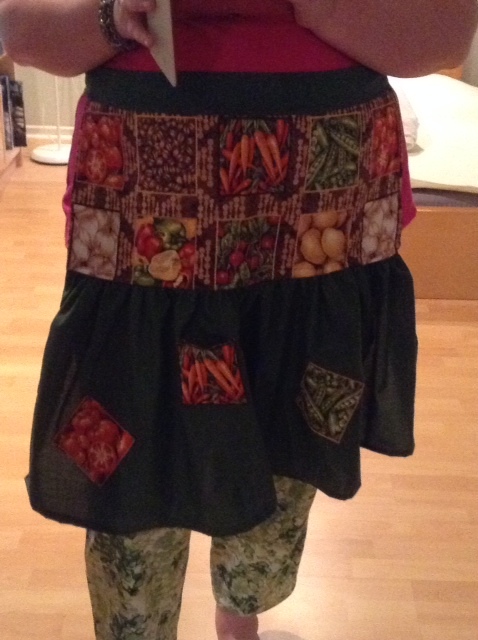 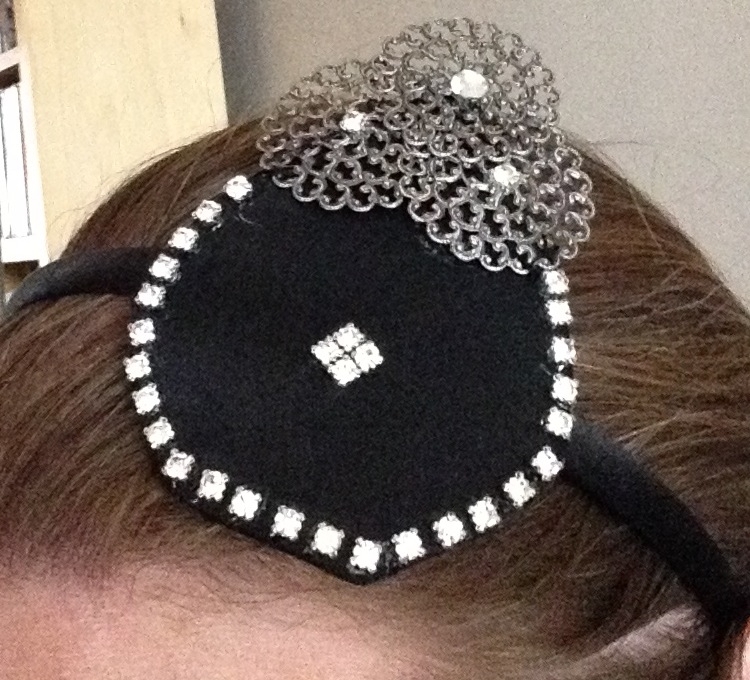 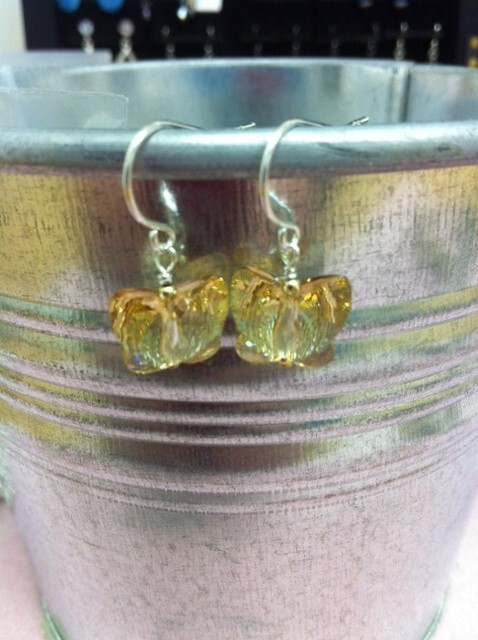 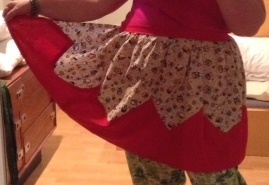 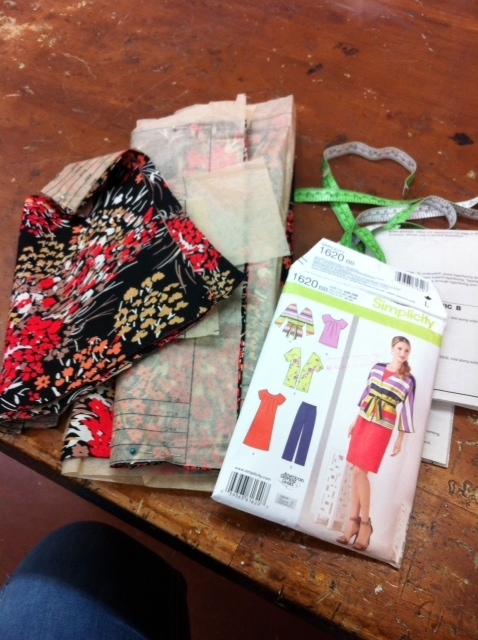 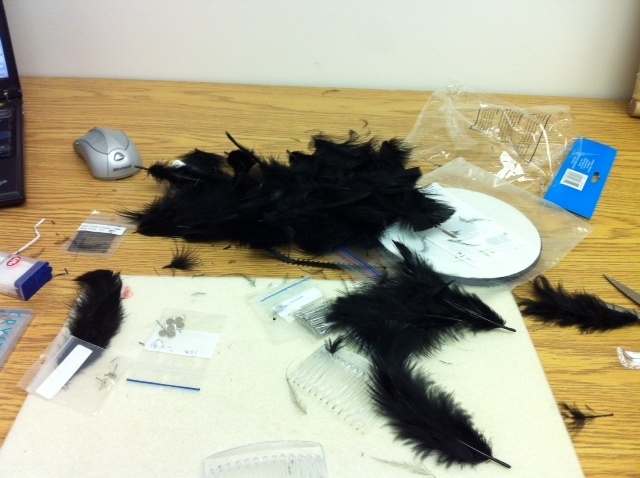 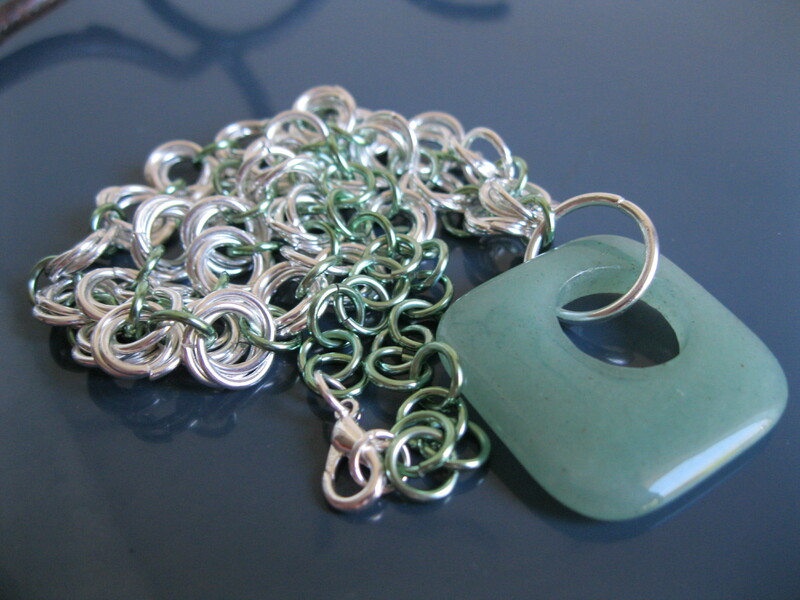 I am not really sure what sorts of things I should bring to the show so I have been making lots of different items. 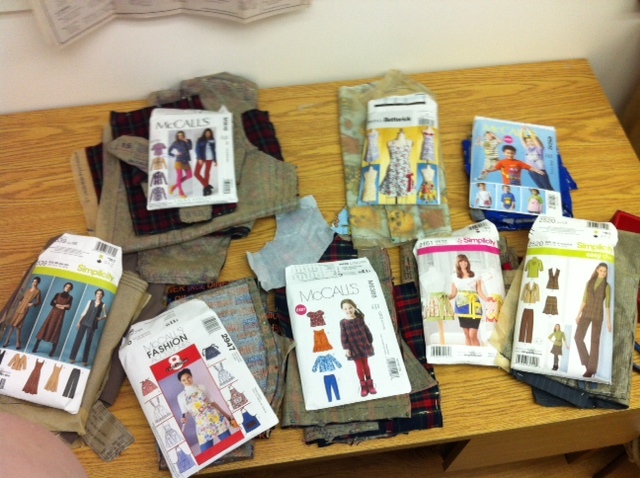 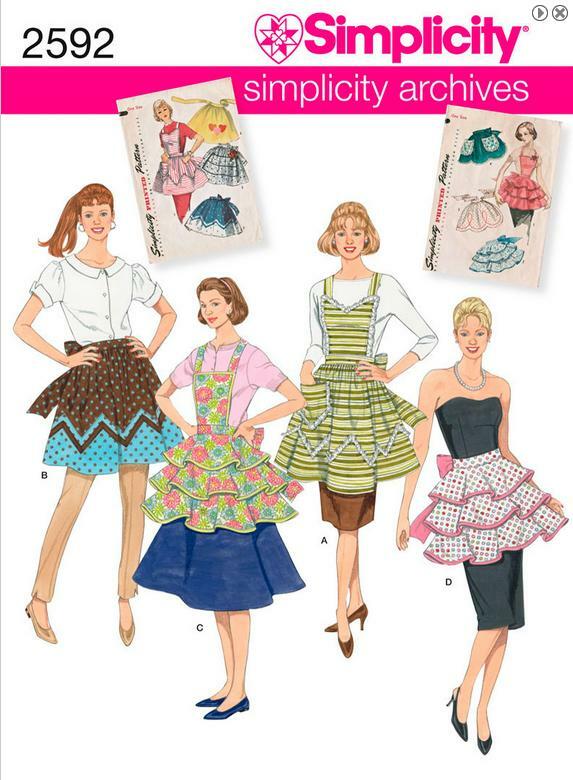 Here are a few different examples. 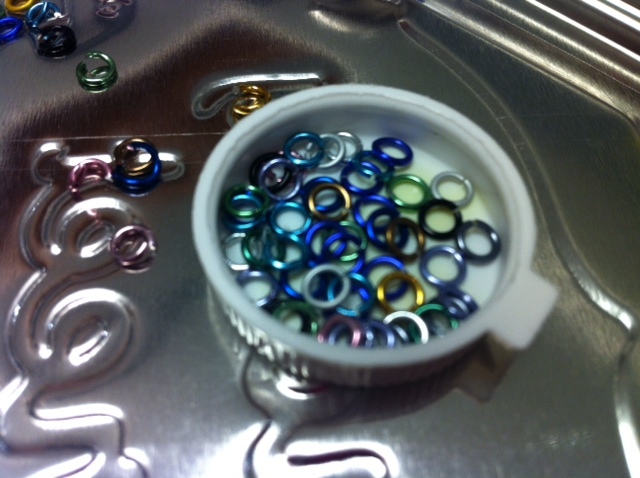 Of my new aluminum jump rings that is! 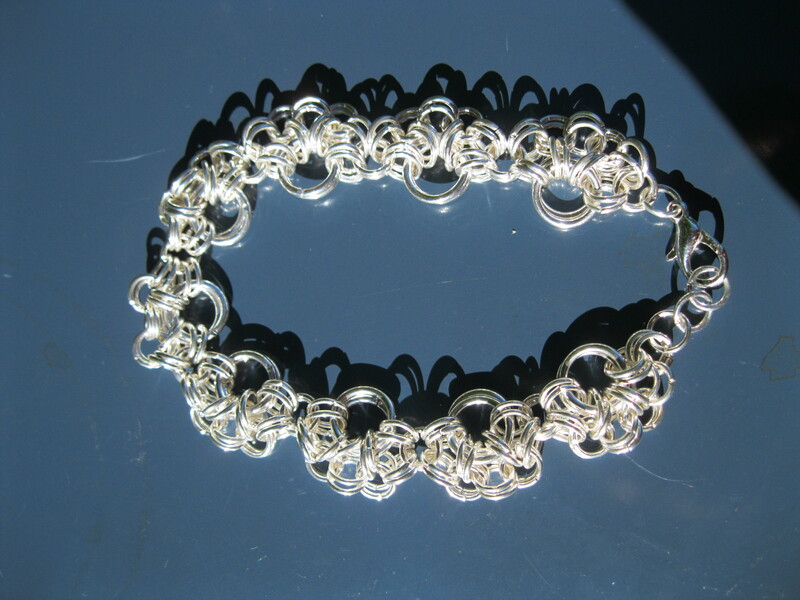 Since last we chatted, I have made another chain maille ball, some earrings and have experimented with a couple of new weaves. 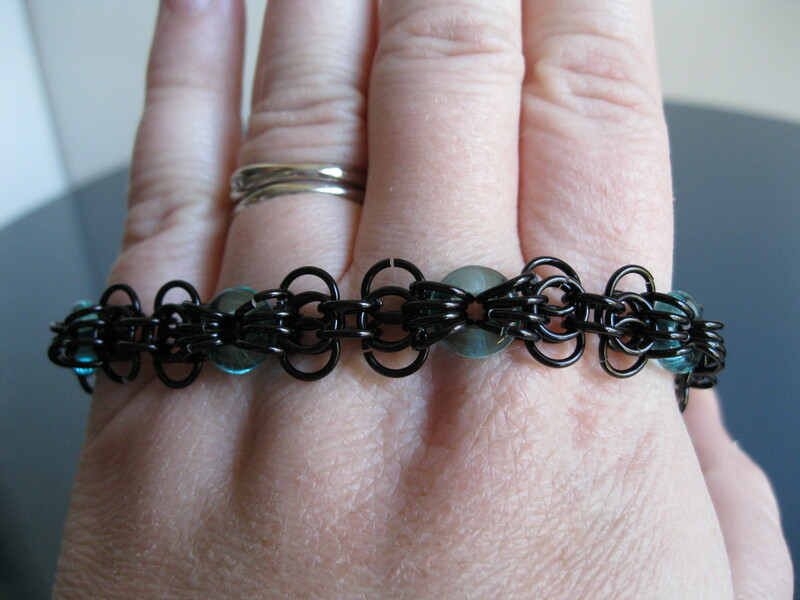 Also incorporating some of my usual plated base metal rings and beads. 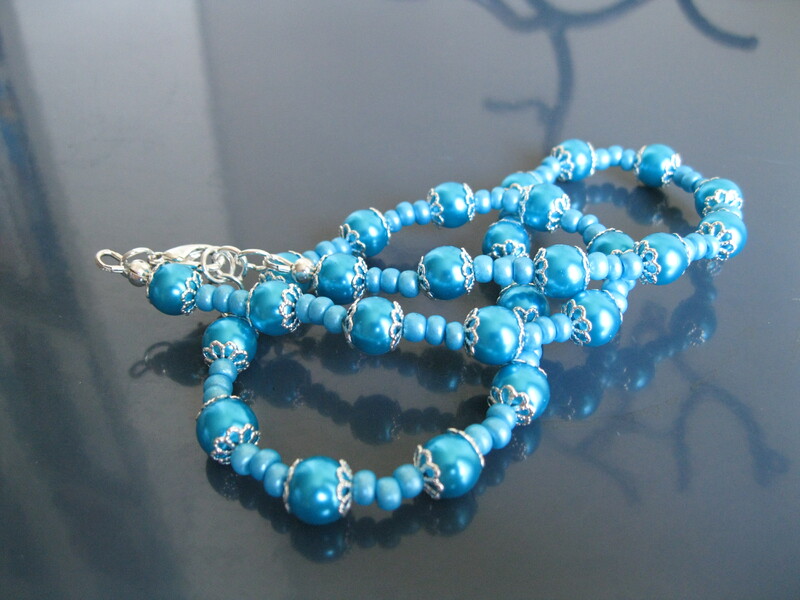 You can’t go wrong with byzantine! 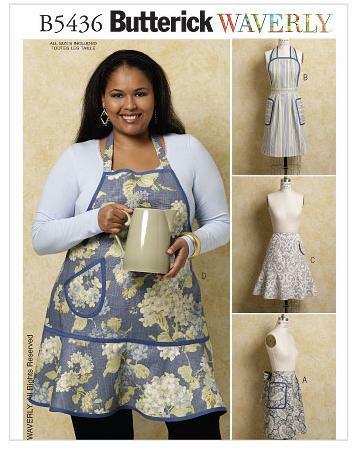 I love this lace like weave I found in a magazine! 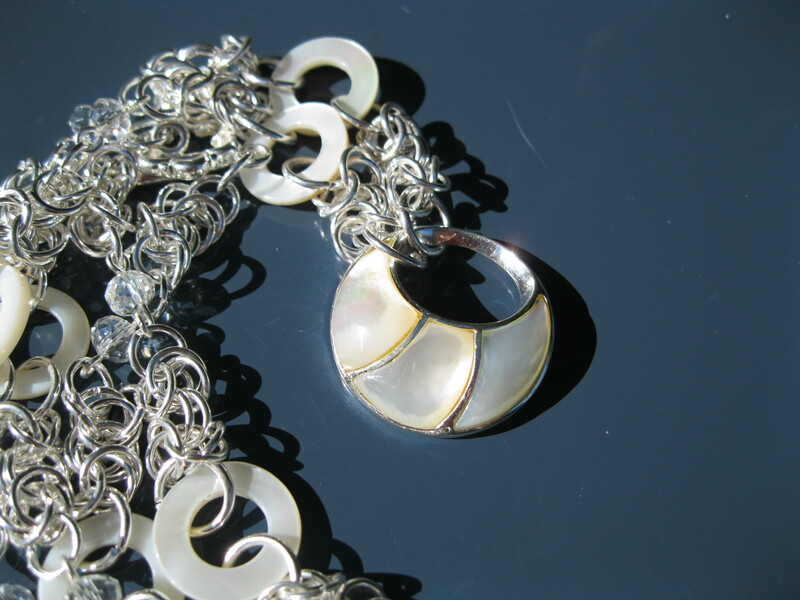 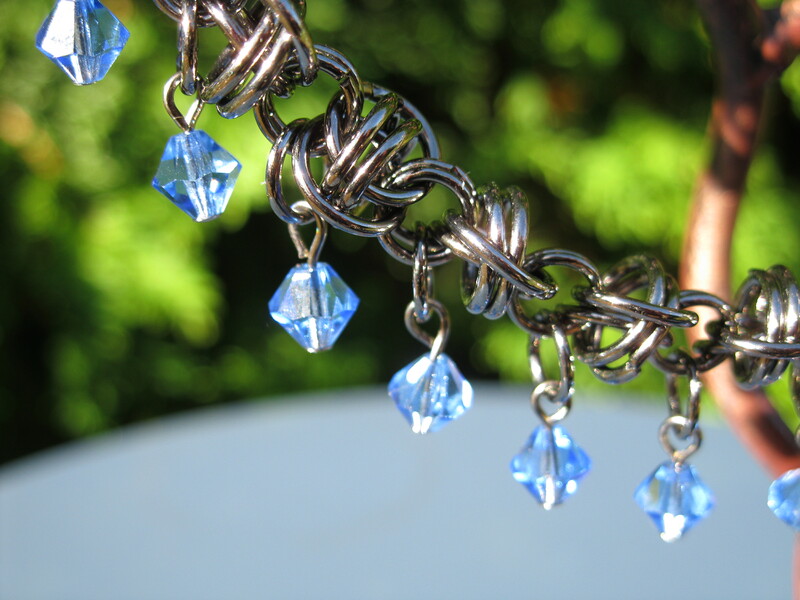 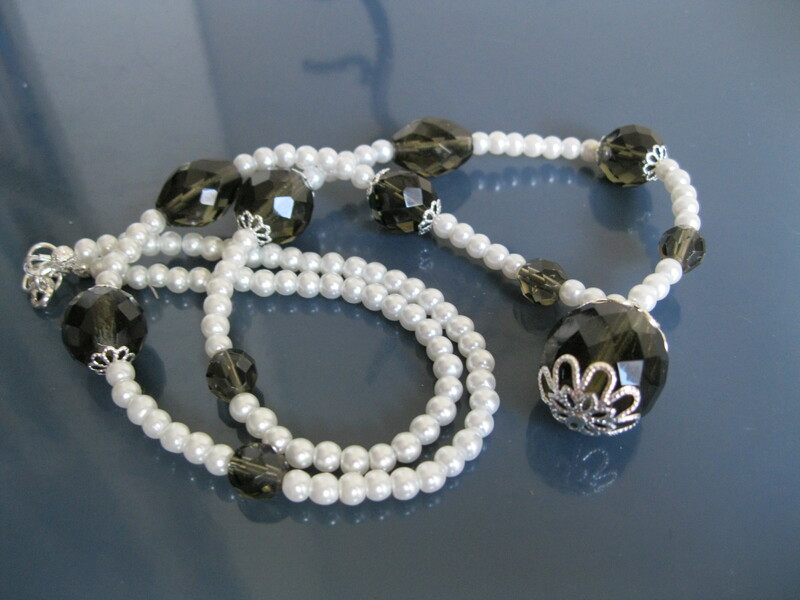 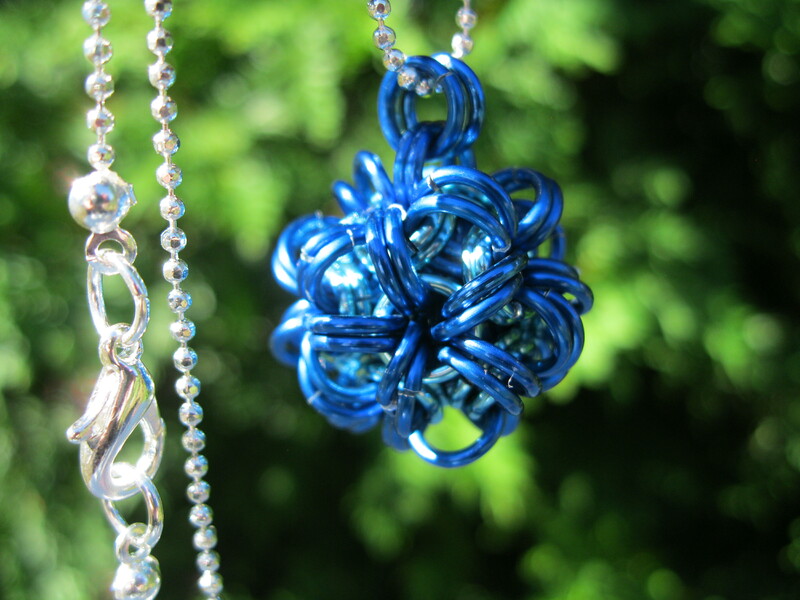 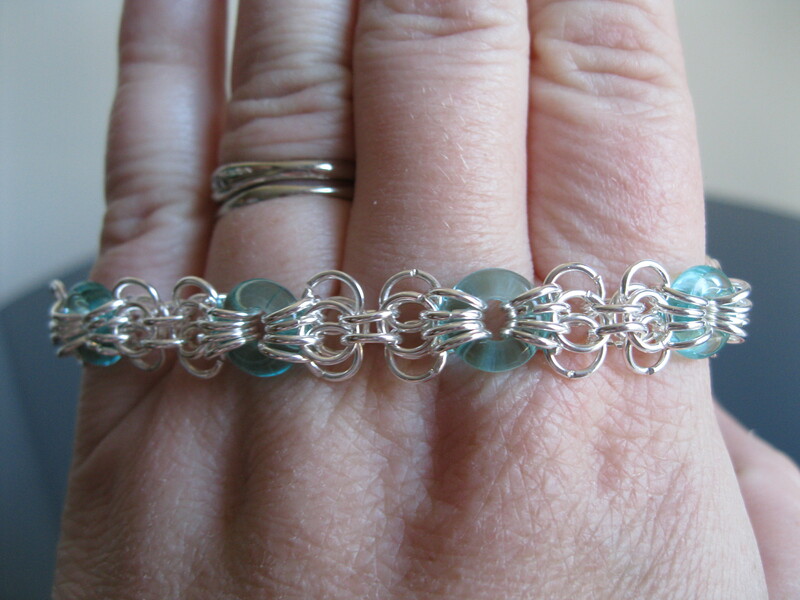 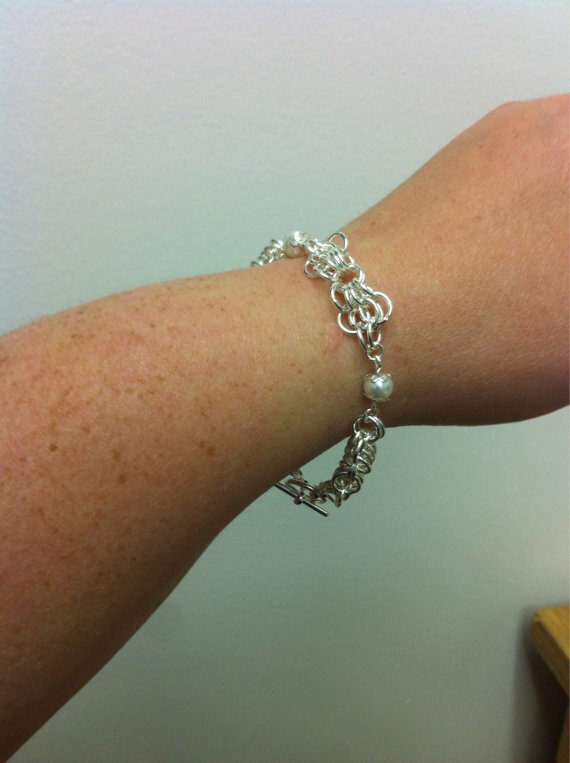 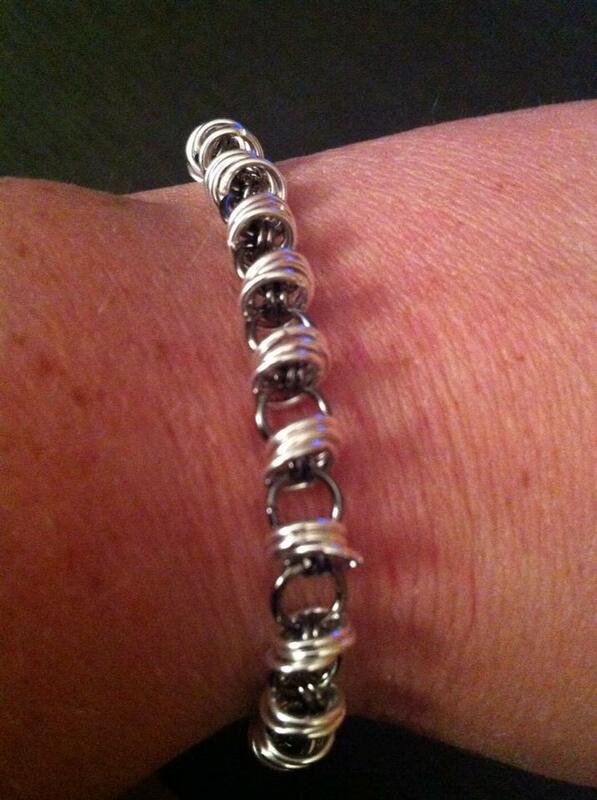 The chain maille ball is a current favourite! 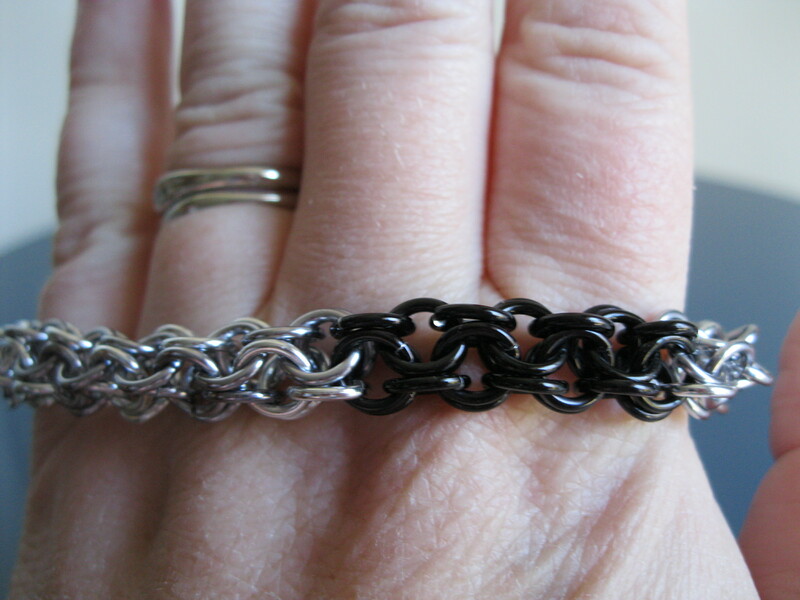 The great thing about the aluminum is that you can make a dense weave like full Persian and it is still super light to wear. 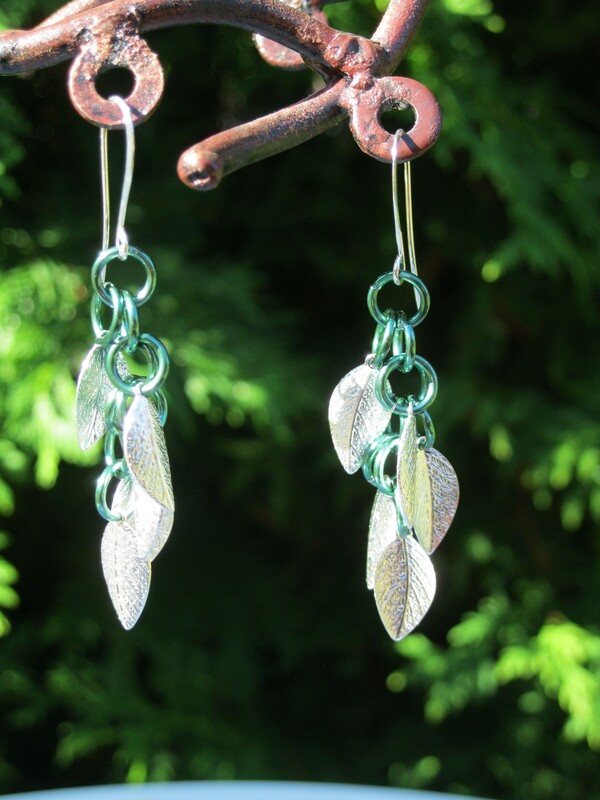 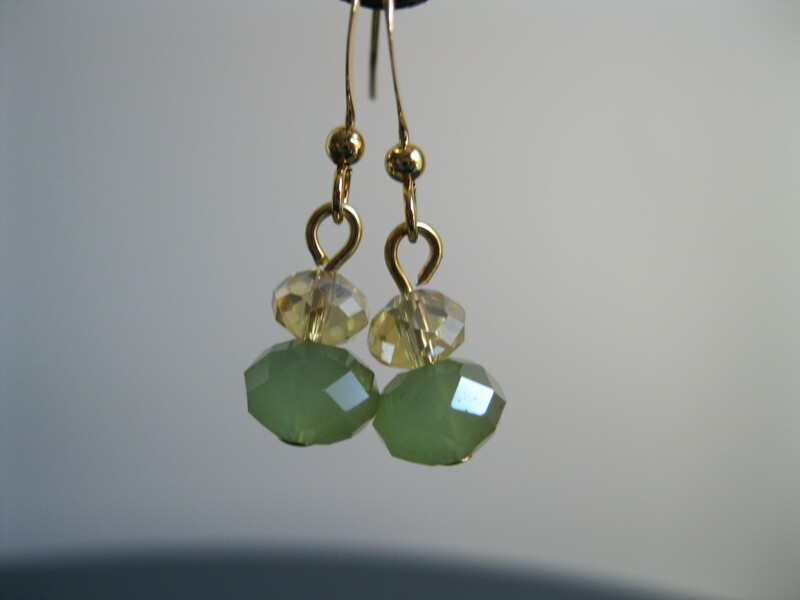 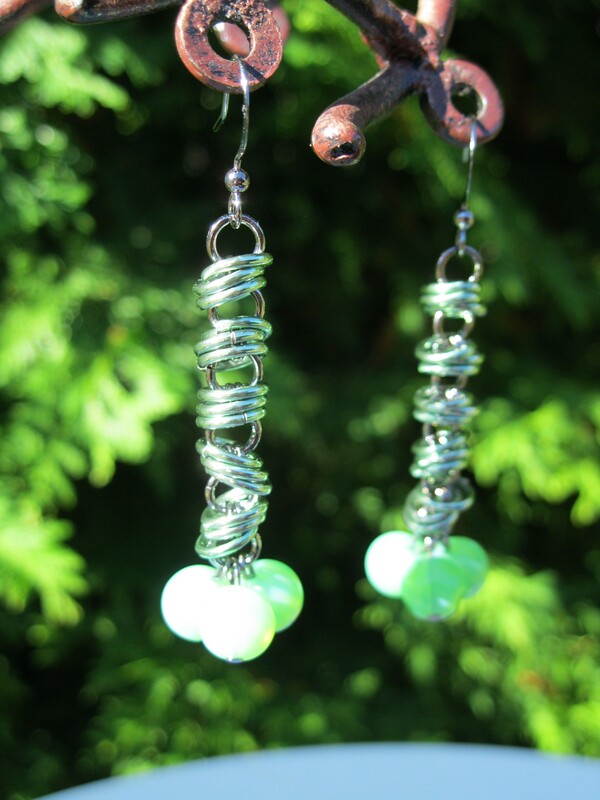 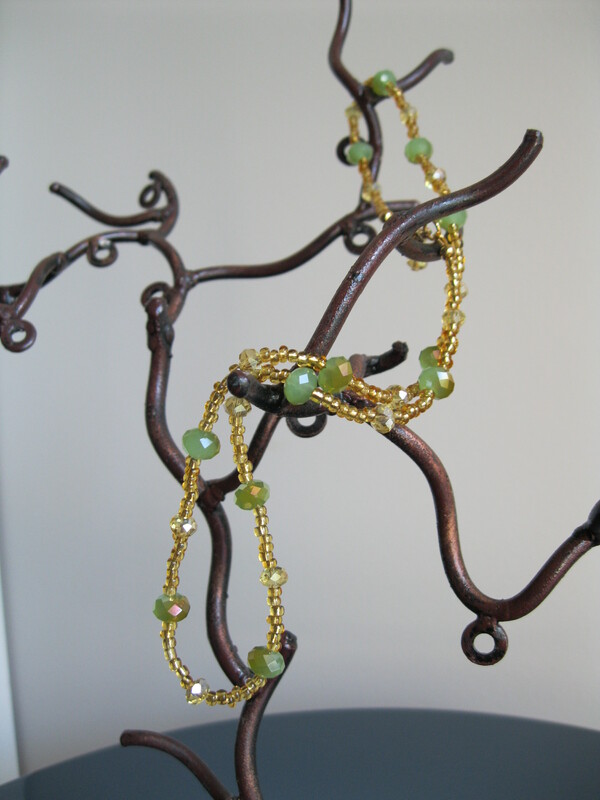 Something simple to show off the bright green rings and the delicate leaf beads. 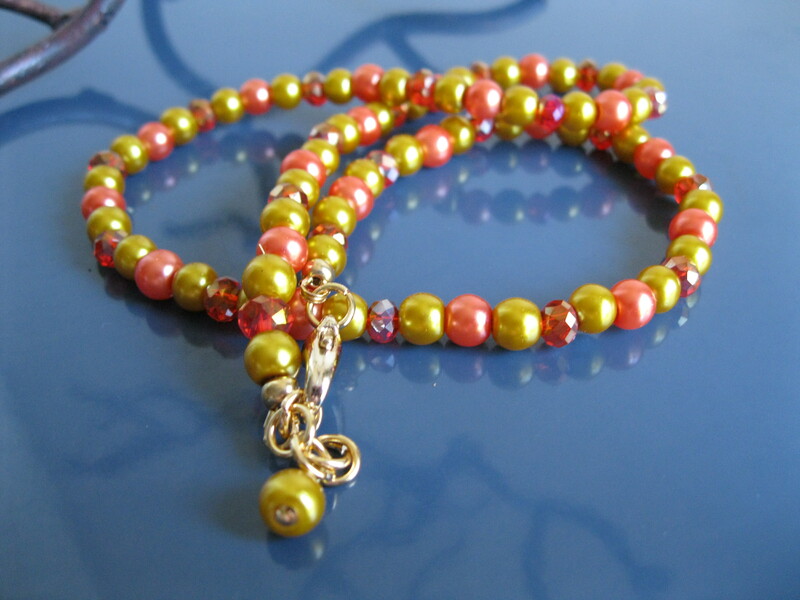 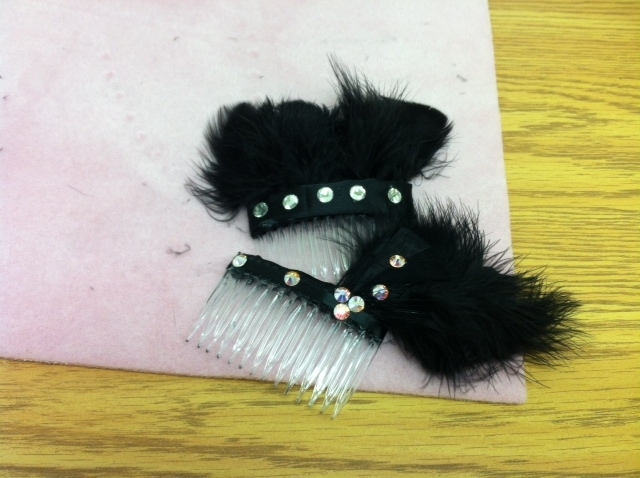 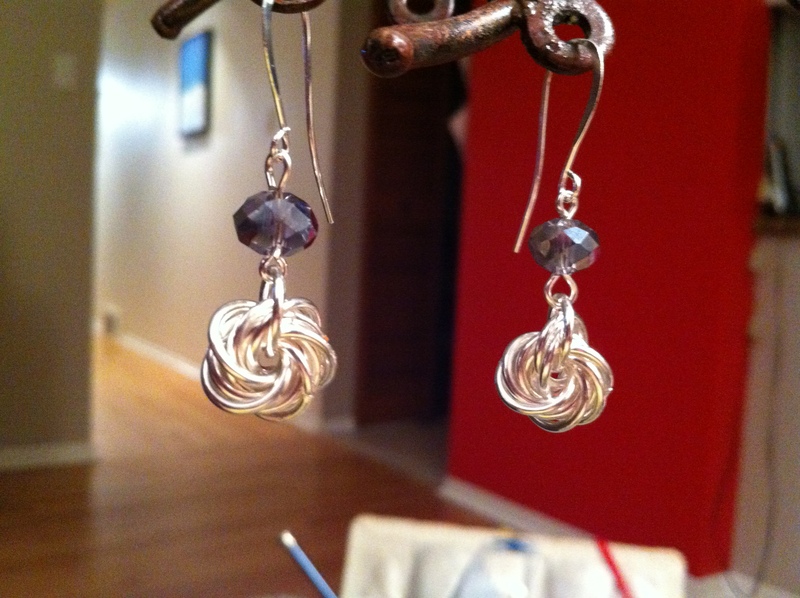 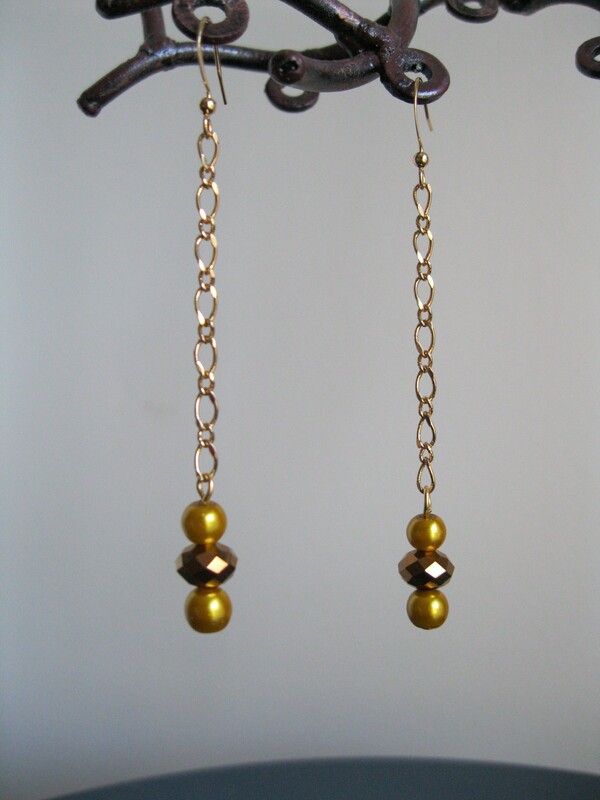 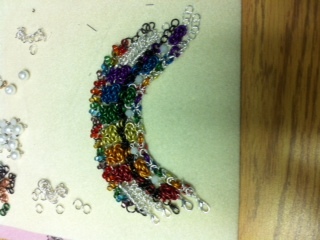 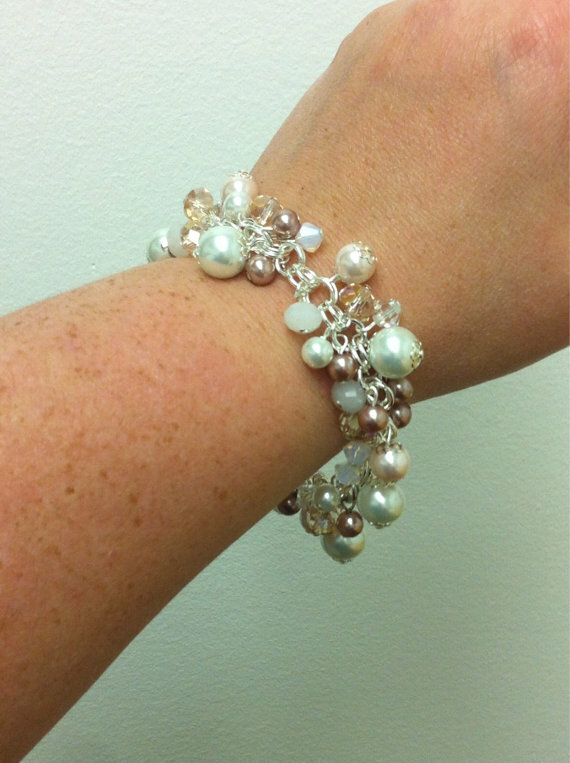 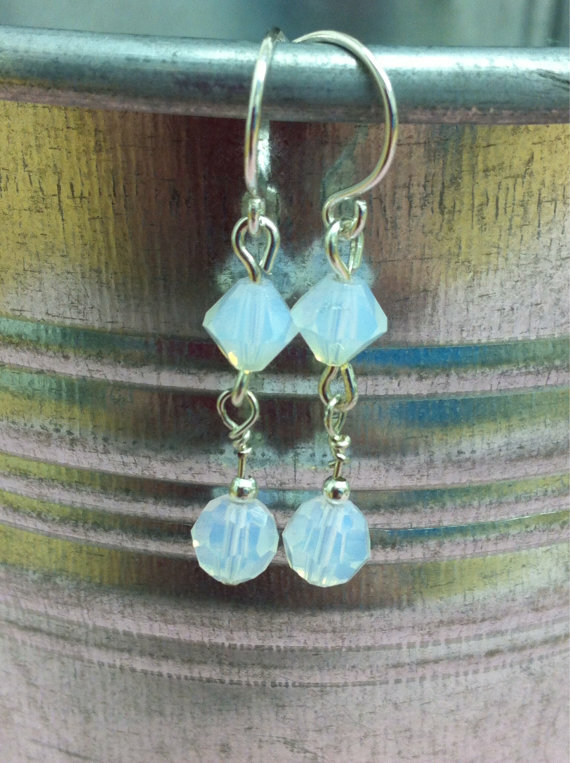 This weave makes great earrings as well as bracelets, but it can be frustrating to assemble at times. 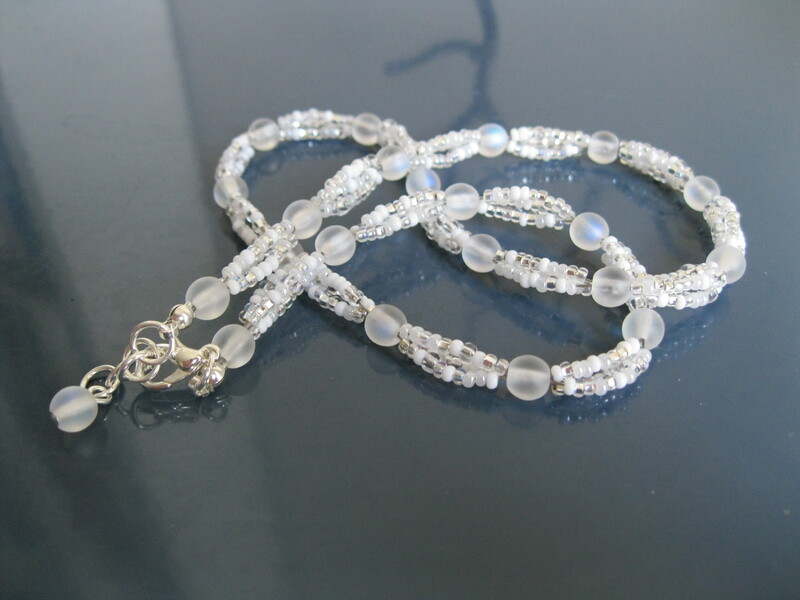 I do love the rosette look and you can’t go wrong with adding crystal to pretty much anything as in the case of the barrel weave with 6mm sapphire bicones below which makes for a rather glamorous necklace. 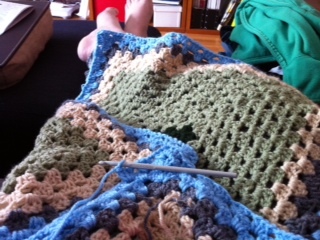 As you can see, I have been very productive in the last couple of weeks. 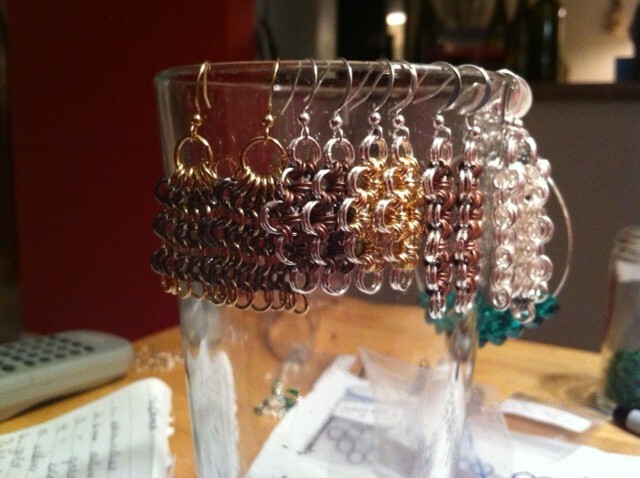 Thursday, my friend Meghan came over for an evening of pizza and beading. 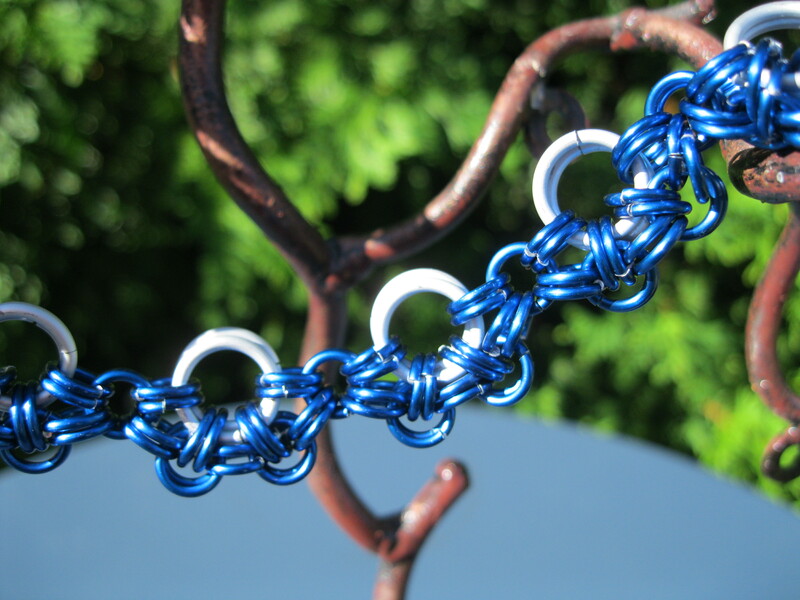 We both decided that it was a chain maille kind of event. 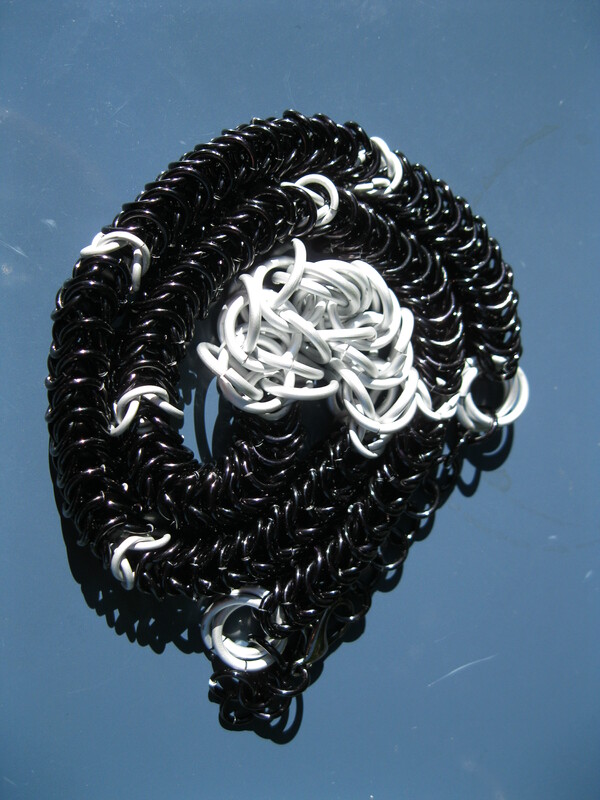 I still have a fair amount of the colourful anodized aluminum jump rings that I got from the Ring Lord and so I made another chain maille ball, this time in black and red. 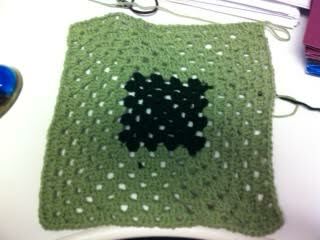 Now that I have a comfortable grasp of the pattern itself, I can now play with the colour schemes some more. 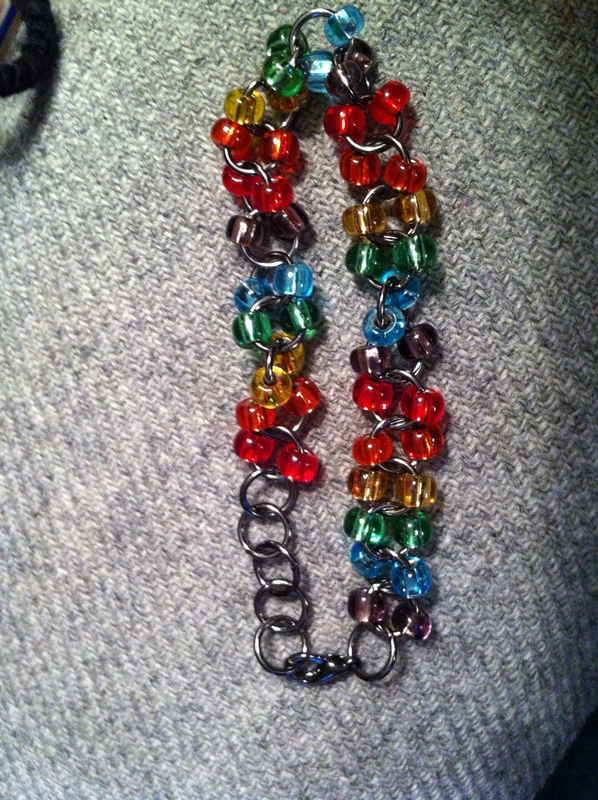 I also made a few other items that night and last night as well. 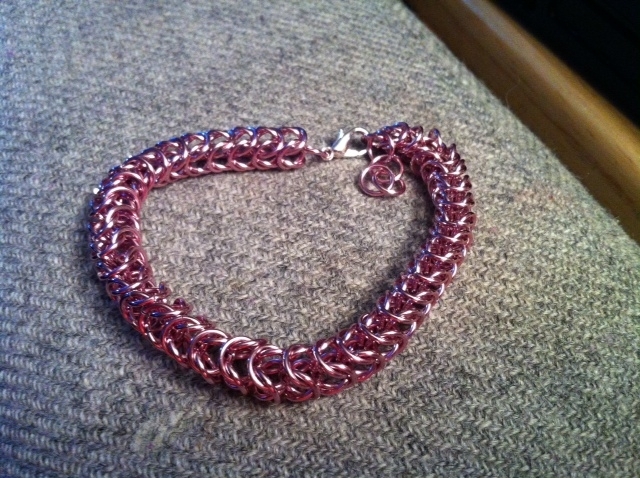 There was a new chain maille weave I was itching to try out called Inverted Round, I got the pattern from CGMaille.com. 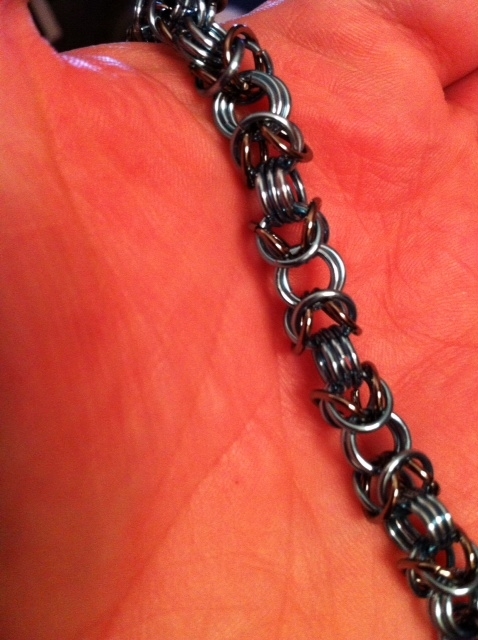 The first one is a mix of bright aluminum and a regular aluminum with a section of black worked in. 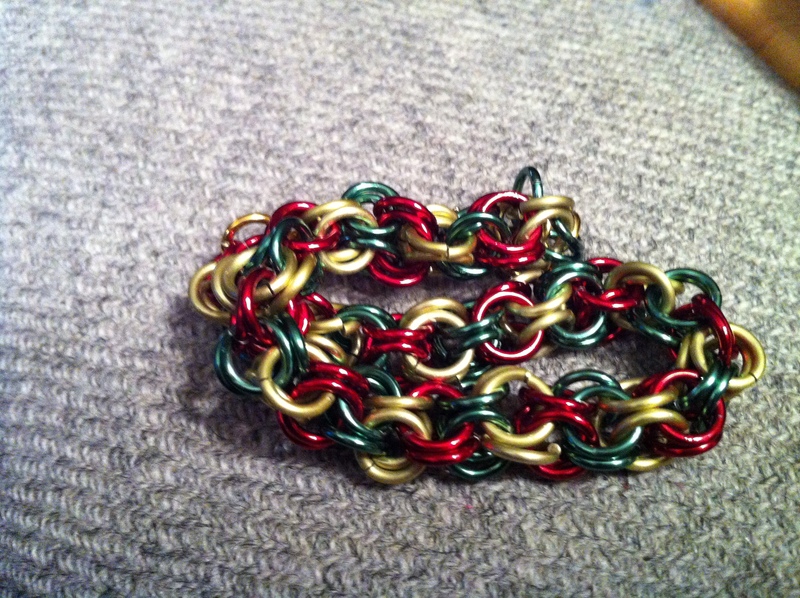 I also had a lot of red, green and gold, so I thought, hey, something for the festive season. 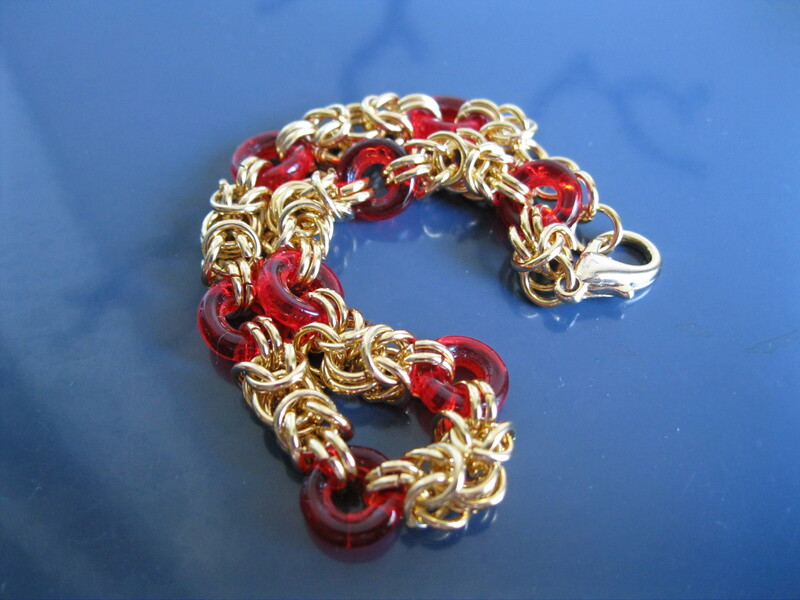 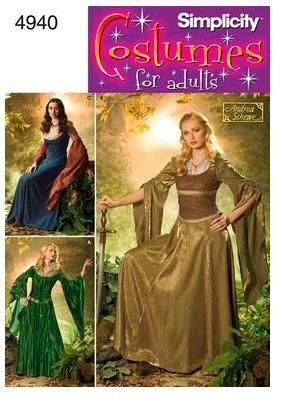 The next pattern from CGMaille.com that I want to try is the Dragon Scale and the inverted Round with Captive Rings. 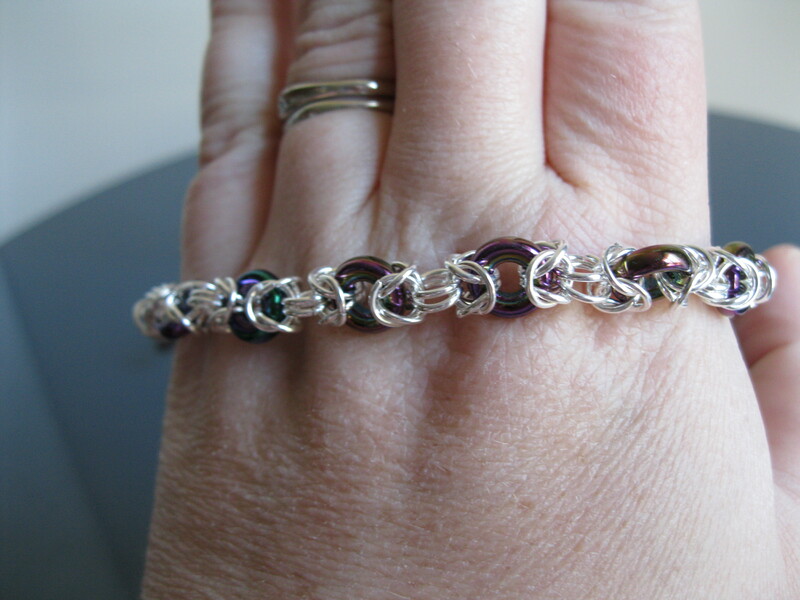 I also have taken a liking to making rosettes from rings, some with just three, like this cutey cute bracelet in pink, purple and lavender. 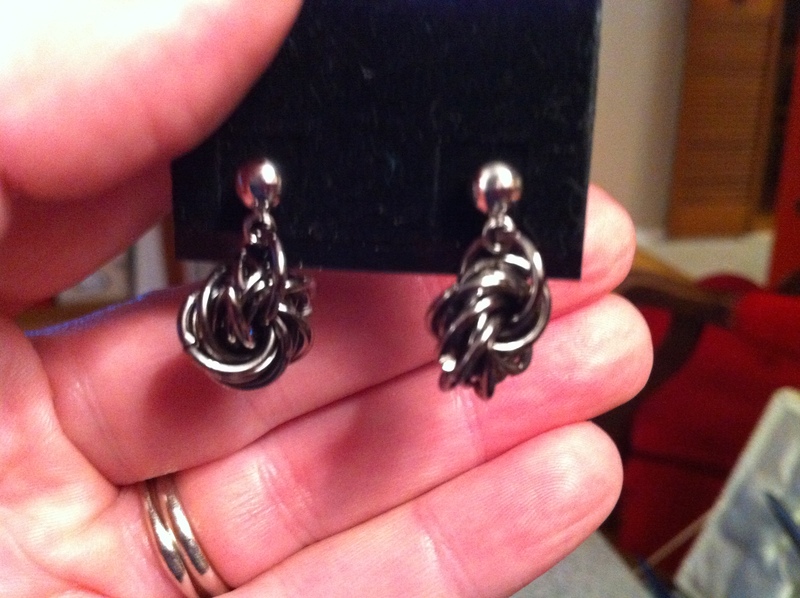 And some with with many rings to make a dense almost ball like rosette. 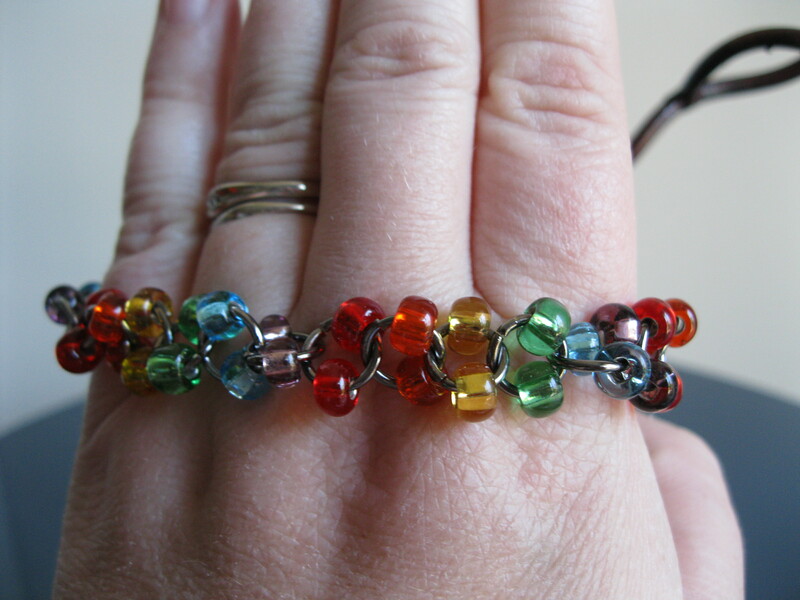 I also used one of my favourite patterns, the size 2 seed bead and 9mm jump ring, to make this fun rainbow bracelet! 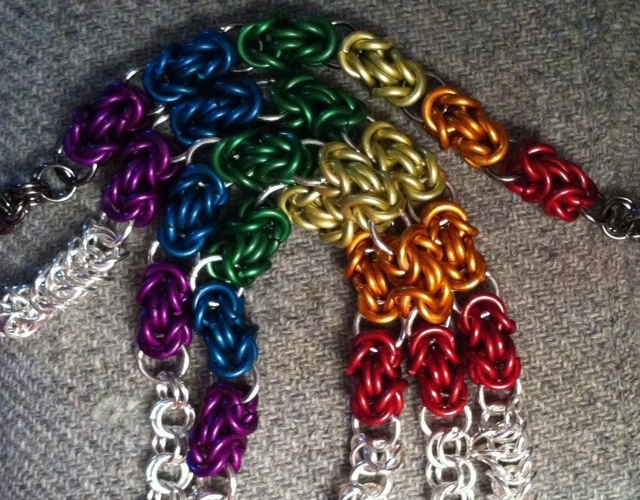 Yesterday I put another order in to the Ring Lord for more aluminum jump rings in rainbow colours which I cannot wait to get working with!